The worst recorded sandstorms in history are hitting the city of Dubai. People are stranded and civilization is clinging to life as the sand has cut them off from the rest of the world, leaving most buildings completely covered and totally destroying the lower levels of the city. Colonel John Konrad, the troubled commander of the 33rd Battalion, United States Army, volunteered his unit to help the relief efforts. When the US Government issued the immediate evacuation of Dubai, the 33rd refused. The sandstorms got worse and a big storm wall engulfed Dubai, disrupting any satellite communication, surveillance and air travel. The 33rd declared Martial Law but struggled to maintain any sort of order. To add to the disaster, civilians began to riot and resources started to deplete. The United Arab Emirates later declare Dubai as a no-mans-land and barred all travel to the city. After weeks of no news, a strange transmission is received through the storm wall. The message is from Colonel John Konrad. Because of this transmission, the United States decides to covertly send in three Delta Force Operators. You are Captain Martin Walker. Alongside you are Adams and Lugo. The main objective is to find the source of the transmission and execute a rescue mission for Colonel Konrad and the 33rd. This is a simple premise but it quickly becomes apparent that something is severely wrong as you discover that the 33rd has gone rogue and that the CIA is involved. If there is one thing Spec Ops does extremely well, it would be the story. It is a grim tale of war and the toll it takes on the mind of a soldier. The plot is told very well and the game offers up plenty of twists that will keep most guessing until the very end where it then turns everything you thought you knew, upside down. The game also does a great job of putting you and the three characters through hell. You will make gut-wrenching decisions, walk down corridors of dead civilians and soldiers, fight and kill US soldiers and many more disturbing but effective set-pieces. I constantly found myself second guessing actions that I previously took and trying to recover from the horrible scenes that I just witnessed. Some may say Spec Ops tries too hard to “shock” you but I think what they do here is a very effective way of getting into your mind and messing with it. 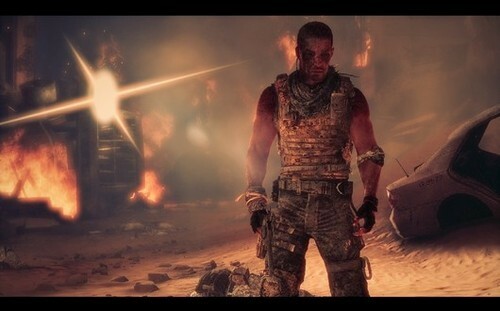 As I previously mentioned; Spec Ops does a wonderful job of putting the characters through hell. By the time the end of the game rolls around, these soldiers are literally shadows of their former selves. This war has taken its toll and it shows. The only issue that I had with the story is that it ends very quickly. Spec Ops can be completed in less than 8 hours. Spec Ops’ storytelling brings something new to the third-person shooter genre but unfortunately, the same cannot be said about the gameplay. 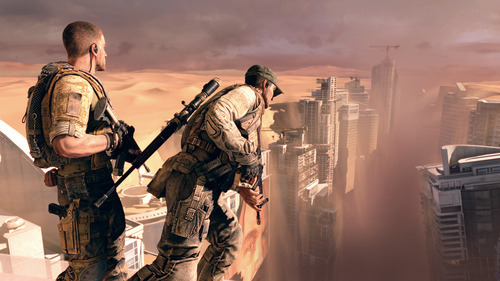 Spec Ops: The Line is a standard third-person cover based shooter that takes a lot of ques from other games of the same genre like Gears of War and Socom. You will run into a room, hide behind a couch or desk and shoot waves of enemies in the face. When you’re done, you will walk a little and then repeat the shooting process again. The whole game plays like this and while the controls do feel good and tight, it just has that “been there done that” feeling about it. You can use two weapons at a time, three different grenades and you have the option to melee if you wish. The shooting feels good and is quite fun and throwing grenades works, however; the melee is pretty lack-luster and feels sluggish. It really does have the same “feel” as a Gears of War melee. This is not necessarily a bad thing but it feels like a copy and paste job the whole time. It also has those genre cliché moments like shooting from a helicopter or riding along a vehicle defending it. 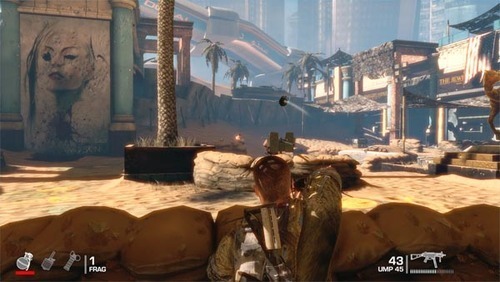 The only thing Spec Ops adds to the gameplay or tries to add is the sand. A sandstorm can roll in; blinding your vision and you even have the option to shoot a window to have an avalanche of sand crash down on your enemies, stalling them long enough for you to take shots. These gimmicks aren’t quite dynamic since it can only happen at certain set-pieces in the game. They are cool features but the sandstorms aren’t random and don’t offer much opportunities to use sand as a weapon. These features could have been much more memorable if sandstorms were more often. It’s a shame in a way as the whole sand feature could have been something unique and something Spec Ops would have called its own; instead it’s just a missed opportunity. The game also tries to add a stealth element as well. At certain points, you can equip a suppressor and sneak through a level. The problem is that if a guy sees you, even for a split second, every person in the level now knows where you’re at. The sneaking feels a bit broken and is never necessary. The game does have a tactical element to it since you can call out enemies and allow your squad mates to take care of them. This feature actually works pretty well and at times you can go through a whole firefight without firing a single bullet. The problem again being is that it is never necessary. Some players may never even know you can even do these actions. The game does not support any co-op but does come packed with competitive multiplayer. It has all your standard modes and progressions system that come in all shooters today. Like the gameplay of Spec Ops, the multiplayer does nothing new and it also feels extremely tacked on; this severely hurts the replay value of the game. You do have Intel to collect and there are different difficulties but you may not find too many other reasons to put Spec Ops back in once you are done. The one redeeming quality I found that would make me go back is to experience the story once again, but that is just me. The overall presentation is a mixed bag. The game looks decent and is appropriately brown as the city is covered in sand. You may get pretty bored with the overall color pallet but there are some truly gorgeous moments in the game. You will stand on top of towering skyscrapers and have the ability to look out over Dubai. These are the few moments in the game where the presentation impressed me. The rest of the time, the game just looks okay. The voice acting is good although it was very strange to hear Nolan North shout F-bombs every few seconds. Besides that, the rest of the voice acting is on point and is convincing enough. The soundtrack however, was pretty forgetful. At times throughout the game, some old-school 60s-70s rock songs would play which is a neat touch but other than that the score didn’t really do it for me. Spec Ops: The Line is a good game. It’s just the total lack of innovation on the gameplay side that is a complete bummer. I know, not every game is going to reinvent the wheel but the gameplay is so copy and paste from other third person shooters that it’s hard to shake the feeling of “been there done that.” The thing that really makes Spec Ops stand out is its amazing story. It not only puts the characters through hell but it also makes you, the player, go through many different emotions. From anger, to sadness, to sometimes complete disgust, you will go through a whole slew of emotions that you never thought a military shooter could put you through. For that Spec Ops: The Line should be experienced by gamers everywhere. I suggest every gamer experience Spec Ops: The Line. However, I do recommend waiting until it drops to around $20. The game is very short and has little replay value.